It’s no secret that the lace trend has been around for a very long time, and is still going strong. Most people would associate the lace dress with weddings or formal events, but in today’s fashion there are more ways than ever to wear your lace. The lace trend has made a gradual shift from classy to a more casual look over the years. Brands like Self-Portrait have done an amazing job with covering both classy and casual bases with their line of lace dresses. So even if your style is more chic and edgy or demure and classy , the evolved lace trend is sure to fit either taste. I’ve decided to wear my Self-Portrait frilled column dress a little more edgy and chic. 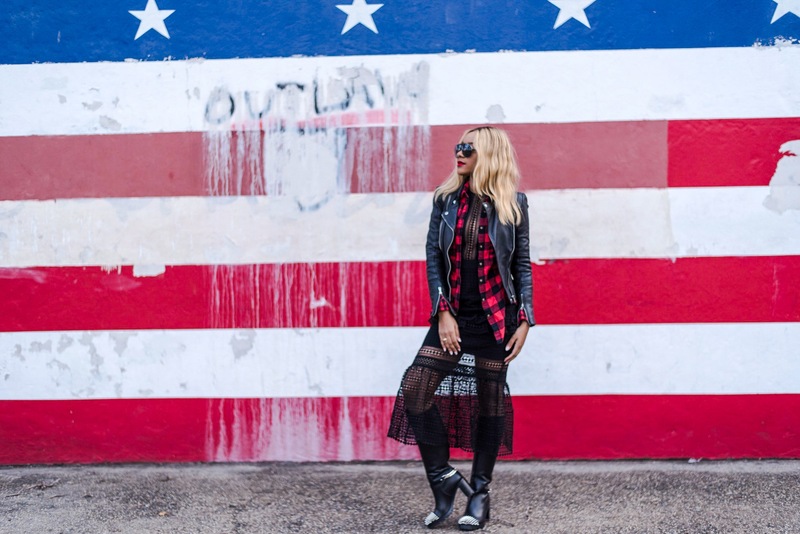 Layering with my BDG flannel and Zara leather biker jacket. Definitely not your traditional take on how lace is worn. I traded in the stilettos for my Christian Louboutin Napaleona spiked boot, to give my look a more rock-star feel. A lace dress like this can also be fitting for a more formal look. Minus the leather and layers ,and pair with a heeled pump or sandal. You can easily transform this look from a casual day to formal night .